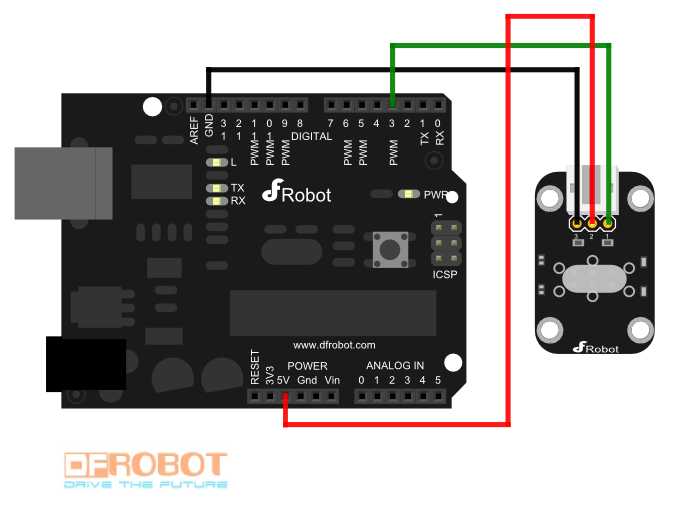 The DFRobot Tilt Sensor is a digital tilt switch. It could be used as a simple tilt sensor. Simple plug to our IO/Sensor Expansion board, you can make amazing interactive projects. The dedicated sensor expansion boards with the Arduino, in combination, can achieve very interesting and an interactive work. Q Dear Sir/Madam, I'd like to know what angle does this tilt sensor trigger? How sensitive is it? Can the tilt angle trigger be adjusted? A It's just a simple digital tilt sensor, if the sensor are not placed on a strict flat surface, the little steel ball in the green tube will slip to one end of it, so it will output 0 or 1 digital signal, that's why we call it a "Switch". Actually strong vibration can effect it's output, but generally speaking, it's about 3 degree to make it slip from one side to the other side. Then you could know that its tilt angle could not be adjusted. Get DFRobot Tilt Sensor (SKU:DFR0028) from DFRobot Store or DFRobot Distributor.